Find a quiet, comfortable space. On inhale say, "Not my will"
On exhale say, "but yours be done." As you come to be with God in these moments, take heed of how you feel. what emotions, pictures, current events come to your mind and heart. 1HAVING SAID these things, Jesus went out with His disciples beyond (across) the winter torrent of the Kidron [in the ravine]. There was a garden there, which He and His disciples entered. 2And Judas, who was betraying Him and delivering Him up, also knew the place, because Jesus had often retired there with His disciples. 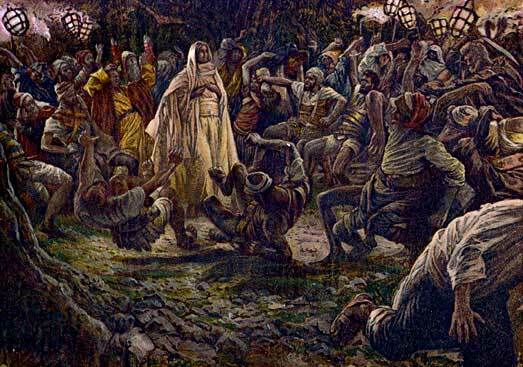 3So Judas, obtaining and taking charge of the band of soldiers and some guards (attendants) of the high priests and Pharisees, came there with lanterns and torches and weapons. 5They answered Him, Jesus the Nazarene. Jesus said to them, I am He. Judas, who was betraying Him, was also standing with them. 6When Jesus said to them, I am He, they went backwards (drew back, lurched backward) and fell to the ground. 7Then again He asked them, Whom are you seeking? And they said, Jesus the Nazarene. 8Jesus answered, I told you that I am He. So, if you want Me [if it is only I for Whom you are looking], let these men go their way. As I think about God's love demonstrated to me during his last week of life, this scene is one that stirs awe in my soul. I've visited Israel - and the Garden of Gethsemene is just across from Jerusalem through a narrow little valley. 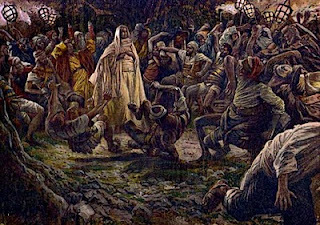 Surely the detachment of soldiers sent with lanterns and torches (some commentators estimate up to 200 soldiers were on their way) could be easily seen by Jesus as the soldiers marched their way toward him. Jesus could have easily slipped away over the Mt. of Olives into oblivion. Instead, Jesus, now betrayed by a kiss from Judas, goes straight out to the troops and says, "Who is it you are seeking?" They answer, "Jesus of Nazareth"
He answers, "I am he." I am he - I am. The very name of God. And at the very name of God being spoken into this moment, the soldiers were knocked over and fell to the ground. Two words...I am. This time Jesus says it again - but without the previous display of power. "If you want me, let these men go." How does this demonstrate Jesus' love and power? He doesn't run away when given the opportunity. Fully knowing all that will befall him, he lets himself be betrayed by a kiss, but not without letting Judas know exactly what he is doing. He exerts his authority, yet does not usurp his arrest. On this, Good Friday, the day Jesus is arrested and soon to be tortured, mocked, spit upon, beaten, falsely accused, abandoned and hung on a cross... thank him for his willing obedient love. Then take 3-5 minutes in paying attention to how your heart wants to respond Jesus' love for you. As you leave this space, ask God to give you the grace to embrace his sacrificial love for you.